1. Singer Jaz Coleman was born in Cheltenham to a high-caste Bengali mother and an English Father. He was a distinguished violinist and a choirboy as a child. 2. Jaz fled to Iceland in 1982 believing that the apocalypse was imminent. He has since lived in Leipzig, Cairo, Tahiti, Budapest, Switzerland and New Zealand. He claims to hold four passports. 3. Killing Joke’s bassist Youth once tried to start a fight with journalist Paul Morley after a bad review. “Luckily he was so drunk that he slipped on some beer and fell to the floor”, says Morley. 4. Youth’s baffling list of credits as s producer includes Marilyn Manson, Tom Jones, Bananarama, Blue Nile, James, Crowded House, PJ Harvey, The Verve, Nick Cave, U2, Axl Rose and Paul McCartney. 5. 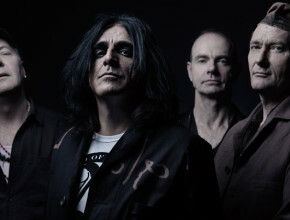 After noting similarities between Killing Joke’s “Eighties” and Nirvana’s “Come As You Are”, KJ started legal action but dropped it after Kurt Cobain’s death. Jaz has since guested with Foo Fighters, while Dave Grohl was drummer on KJ’s 2003 album, which was produced by Gang Of Four’s Andy Gill. 6. Other bands who’ve cited KJ as an influence include The Cult, Pearl Jam, Faith No More, Nine Inch Nails, Ministry, Skinny Puppy, Metallica, Soundgarden and even Kate Bush. The Darkness attended a recent KJ show in Camden, KLF’s Bill Drummond tried to join KJ after Jaz fled to Iceland and The Orb’s Alex Patterson was a KJ roadie. 9. Jaz’s brother Piers is a professor of theoretical physics at Rutgers University in New Jersey. In 2003 Piers and Jaz were commissioned to write “Music Of The Quantum”, a piece uniting art, mysticism and science.